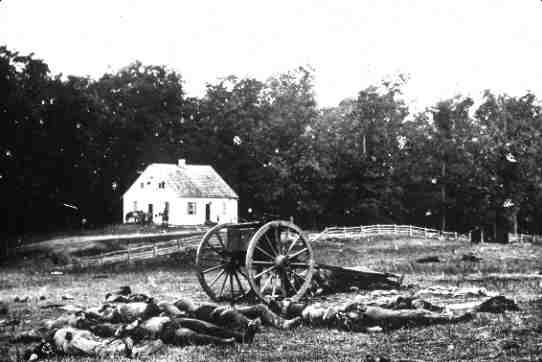 Whether known as the Battle of "Antietam" or "Sharpburg" (as in Confederate recollections), the military engagement of September 17, 1862 was the bloodiest single day in the American Civil War. More than 23,000 soldiers on either side were either killed, wounded, or listed as missing. A significant part of the battle raged around the above building, the Mumma meetinghouse of the Manor congregation of the German Baptist Brethren, who were sometimes called "Dunkers." These people believed strongly that followers of Jesus Christ should not take up the sword. In their own quiet way, they also refrained from the practice of slavery. That their meetinghouse, and the Brethren farmland surrounding it, lay smack dab in the middle of this "bloodiest single day" may be ironic, but it also seems appropriate for the church to be in the middle of human conflict, a visible presence pointing to the One who died - without weapon in hand - that all might live. Many history books since that day have included the above photo by Alexander Gardner of Matthew Brady Associates. In the early 1960's, Brethren minister and historian, Freeman Ankrum*, wrote a book entitled, Sidelights on Brethren History, (©1962, The Brethren Press, Elgin, IL, now out of print), which contained several chapters related to the story behind this Dunker meetinghouse in the days and years surrounding that battle. Take time to read the colorful vignettes Rev. Ankrum painted within the following: Antietam Incidents, Troubles Over Slavery, David Long: Civil War Preacher, and John Lewis and the Antietam Bible. As you read, place the words in the context of when they were written. The 1960's were turbulent years themselves, with civil rights fought over on the streets of this nation. The Brethren, who were among the earliest Christian denominations in this country to refrain from the practice of slavery and one of the few who did not split during the Civil War, were nevertheless not always of one mind when in came to the civil rights of African-Americans a century later. Brother Ankrum was a prophet as well as an historian in reminding the church of its past. More information on this meetinghouse in the context of the people who gathered there for worship, as well as the battle fought around them, can be found at Little Dunker Church - Silent Witness for Peace (an excellent resource written by Ron Gordon on the "unofficial" Church of the Brethren webpage). Who are the Historic Peace Churches? Photo of the church then and now - juxtaposed by "PhotoEcho"
Contemporary Photo of Church - by "Civil War Virginians of the Allegheny Highlands"
Pictures of the church inside & out - by tourist "and dog"
*Freeman Ankrum (b. April 18, 1890 - d. May 19, 1972) served as a pastor in the Brethren Church, one of the offshoots of "the Brethren" (otherwise known as German Baptist Brethren, Tunkers - from the German "tunken" or "dunk" as in "immerse" in baptism, or Dunkers). The son of Armstrong Laird and Lucinda Mack Ankrum, he was a graduate of Ashland College (BA in Classical Divinity, 1914), he served congregations in Iowa, Ohio, West Virginia, Pennsylvania, and Maryland. After his first wife, Viola Myers, died in 1922 (they had married in 1914), he was wed to Esther McAvoy in 1925. From his pen came several books, numerous articles, as well as years' worth of sermons. Though a minister in one of the branches of the Dunkers (a major schism rent the church 1880-83), he published Sidelights on Brethren History through the press of another branch - the Church of the Brethren, an appropriate act given the conflict of which he wrote and the era in which he wrote it. Permission to reprint these pages was granted by his daughter, Mary Alice Ankrum Bowman, and Brethren Press.